It’s early afternoon on a Friday in mid-July, we don’t blame you if you have cottages on the brain. Some of you may be heading to yours this weekend, but for those of you in the market for a new stomping ground north of the city, Horseshoe Resort and Village have the potentially perfect option. You seldom come across a cottage-country spot as versatile as Copeland House at Skyline‘s Horseshoe Resort and Village. The development marries the modernity of a condo to the outdoorsy vibe of a cottage. With 52 activities for kids and adults at Horseshoe Resort and Village and immaculate designs at Copeland House, it’s no mystery why the suites there have been a hot commodity. One of those hot suites is the Alpine — a functional floorplan that takes advantage of every inch of space. 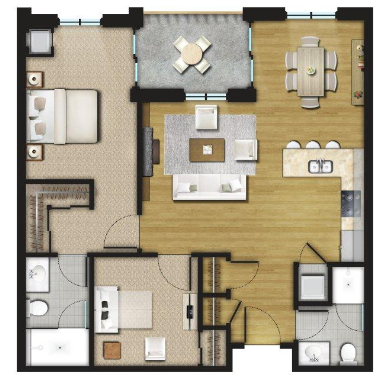 The Alpine features two closets at the entry, two bedrooms and separate living and dining rooms. The design is intended to give homeowners the opportunity to personalize their surroundings as much as possible. Home away from home is the name of the game here! Other boast-worthy features include a fireplace in the main living area, high ceilings, plenty of workspace in the kitchen, and an extra large closet and private ensuite in the master bedroom. The laundry is also centrally located for convenience. Yes, the days of using a washboard at the cottage are long over! 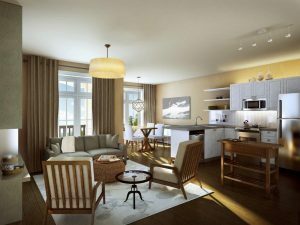 Prices at Horseshoe Copeland House start from $199,900. For more info email jen@horseshoevillage.com or visit the website here.